It's About TV: Pat Summarall, R.I.P. My favorite Pat Summarall moment was from the 1990 Super Bowl, back when I still watched the game. The San Francisco 49ers were in the process of crushing the Denver Broncos - had, in fact, just scored twice early in the fourth quarter to make the score 55-10 (the eventual final), and as CBS prepared to go to commercial, Summerall summed it up as only he could. "This," he said, "is just unfortunate." That he didn't resort to hyperbole, trying to be clever or the coiner of a new phrase, tells you what you need to know about Summerall the broadcaster. In the past, I've referred to announcers like Summerall (Curt Gowdy, Chris Schenkel) as "big-game" announcers, because the sound of their voices lent gravitas to the event they were broadcasting, but as I think about it I think one could add another description: "gentleman announcer." This shouldn't be read as sexist, of course. What I mean is that, like those other men, Pat Summerall was a gentleman in the way he broadcast a game. There was no shouting or hyperventilating every time someone made a routine play, no attempt to make himself the center of attention - the broadcast wasn't about him, it was about the game. He had a rich, smooth voice, was clear and spare with his words, and understated in his delivery. He enjoyed great chemistry with his broadcast partners, notably Tom Brookshier, John Madden and Ken Venturi, and they all profited from working with him. And he respected the viewers. 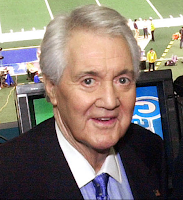 Pat Summerall was one of the first former athletes to make the successful transition to the broadcast booth. He had been an NFL placekicker, most notably for the New York Football Giants, and it was supposedly through his kicking that George Allen Summerall earned the nickname "Pat," for Point After Touchdown. After retirement he moved to the broadcast booth at CBS, first as a color commentator on NFL football (working with, among others, Chris Schenkel), then to lead NFL announcer in 1974, from which he would ultimately broadcast 16 Super Bowls. Besides announcing live events, he was also the host (with Brookshier) of NFL Films' This Week in Pro Football, back when that show (along with Howard Cosell's Monday Night Football halftime show) was the main delivery method for highlights of the week's action. Eventually, Summerall became lead broadcaster on all of CBS' major events, including the NBA, the Masters and the U.S. Open tennis championships. (He even filled in once for the ailing Harry Carey on a Chicago Cubs game for WGN.) It didn't matter that Summerall had never played professional tennis or golf or basketball; he had experts to provide the analysis. His job was to be the professional broadcaster, and he did it as well as anyone. Summerall and Madden moved to Fox in 1994 after the network won the NFC television rights from CBS, and that was good news for the NFL - but not so good for the rest of us, since Summarall's move meant he'd no longer be heard on those other signature events. Nothing against Jim Nantz, but Pat Summerall never felt the need to turn the 18th hole at the Masters into a Hallmark Moment. Outside the booth, Summerall fought a long and ultimately successful battle against alcoholism. In 2004 he underwent a liver transplant, and he had other assorted health concerns over the past couple of decades. He was the longtime commercial spokesman for True Value Hardware, which meant that even non-sports fans probably recognized his voice. Pat Summerall died on Tuesday at the age of 82, and the more I think about it, the more I like that description "gentleman announcer." I certainly like it for Pat Summerall - one of the very last of an era we'll likely not see (or hear) again.